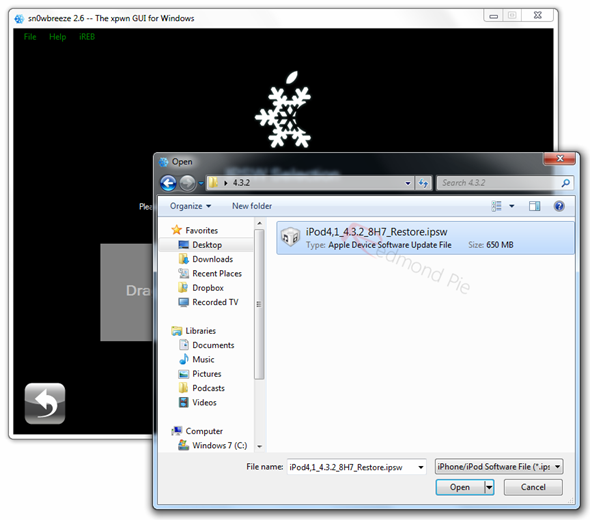 Step 2: Connect your iPhone or iPod Touch to your PC via USB. Step 3: Click “Browse” button and select iOS 4.3.2 firmware which you downloaded earlier, you can also drag and drop .IPSW file on the given area. Step 4: Sn0wbreeze will automatically verify the .ipsw file and the device which is required to be jailbroken. Sn0wbreeze will check the firmware if it is correct. Once the 4.3.2 IPSW is verified, click the blue arrow button to continue. 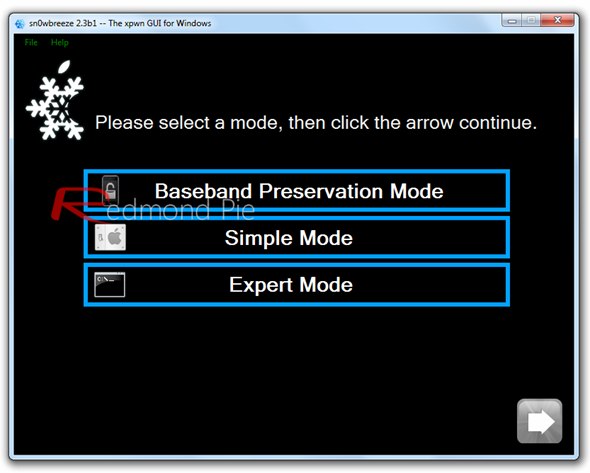 Step 5: Sn0wbreeze will give you option to select either “Simple Mode”, “Expert Mode” or “Baseband Preservation Mode” . Select ‘Expert Mode’ which will allow you to add multi-touch gestures on your device. Or you can just go for simple mode if you don’t want to enable multi touch gestures. Step 6 : If you have an iPhone 4 (factory unlocked) or you are on an officially supported carrier like AT&T, DO NOT select “Activate the iPhone”. Make sure the option is unchecked. But if you rely on unlock make sure to check that option. Step 7: Click ‘Build IPSW’. Since building custom firmware may take some time, you can optionally play Pac-Man game to kill some time. Step 8: After completion press ‘OK’ button to follow the onscreen instructions to put your device into restorable state. Step 9: You will then be prompted to connect your device and click start when you are ready. Please turn off your iPhone 4 or any other iOS device. Put the device in DFU mode. Follow on-screen instructions. Step 10: Start iTunes, click on your iOS device icon from the sidebar in iTunes. Now press and hold Left “Shift” button on the keyboard and then click on “Restore” (Not “Update” or “Check for Update”) button in iTunes and then release this button. Select the pre-jailbroken custom IPSW that was created (must be on your desktop) and click the Choose button. Now relax and wait iTunes will do the rest for you. iPhone will restart on completion of firmware installation.